This is a yummy addition to a staple italian meal. I like to use this instead of garlic bread because you get your veggies and it still has a good flavor with a crunch like you get with bread. These will supper flexible one they are cooked so the outside will be crispy but inside like a cooked zucchini. Add salt pepper and cheese to bread crumbs and mix together. Dip eggplant slices in egg, then in crumbs, and place in hot oil. Fry 2 to 3 minutes on each side, or until golden brown. Drain on paper towels. 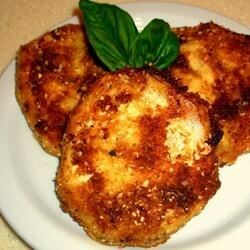 I love fried eggplant and eggplant parmigan, but Brody can not stand eggplant.. looks yummy though! Ahh too bad! Trader Joe's has some pre-made that is pretty tasty, if you just wanted to have some for yourself. Thanks for reading my blog! I never know who does and it's always nice to hear from people!